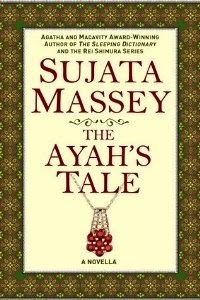 Earlier this week I got word about Sujata Massey's new book via an email from one of the bargain e-book sites I subscribe to. A self-published e-novella written by an award-winning mystery author whose first mainstream historical (The Sleeping Dictionary) was released last fall, The Ayah's Tale examines the plight of a 16-year-old Bengali girl, Menakshi Dutt, who takes a job as an ayah (nanny) to an English family in India in 1923-24. Of course I pounced right on it! This short book contains elements that readers of other historical novels of pre-independence India will find familiar: the bored and neglected English society wife, her wealthy husband, and descriptions of the less privileged lives of their native Indian servants. However, what increases the book's originality is Massey's decision to tell her story from the dual viewpoints of Menakshi and the second eldest son in her employers' family. Julian is a six-year-old boy who exhibits the typical self-absorption of a child whose every need is met, but he's also loving, generous, and observant. In his appealingly youthful voice, Julian reveals many unusual goings-on that readers will know how to decipher, but which he isn't old enough to understand fully. Mrs. Millings, his mother, distracts herself from her dreary life by throwing parties while her high-profile husband, the Commissioner for Burdwan District, devotes himself to his work in the Indian Civil Service. This leaves primary responsibility for the couple's three older children with Menakshi – and so firm are the divisions between social classes that the children don't know her first name or even realize she has one. She is simply "Ayah." There are early warning signs about Mrs. Millings, in particular her sharpness and pointed snobbery. She tells lies about Menakshi's perfectly respectable family to her socialite friends and fails to acknowledge that Menakshi is both educated and a Christian, just like her. All of the drama within the Millings family finally comes to a head during one fateful Christmas holiday. Massey paints a convincing picture of the hypocrisy of society during the British Raj and the deliberate ignorance that keeps three groups – the British, Indians, and Anglo-Indians – separated even as young Indian women working as ayahs become mother figures to British children. I came away with a strong sense of Menakshi's horribly awkward position and the disrespect she has to endure. Although still young, she keeps her dignity and is wise enough to know which battles she can and cannot win. I empathized with her and cheered when a love interest appeared on her horizon. The tale is framed by an episode set much later, on the island of Penang in Malaysia in 1952, as an older Menakshi comes across a novel written by the grown-up Julian in her small town library and realizes it was based on episodes from his childhood. The ending is very satisfying; it allows for some measure of closure for Menakshi, as she revisits feelings about the young charge she had come to care for deeply, and for the reader as well. The Ayah's Tale was published in December as a Kindle original; the list price is $2.99, though it's on sale now for less. Thanks for highlighting this novella. Pre Second World War India fascinates me and I'm mid way through writing an Indian trilogy set in the 1930s/1940s, so reading voraciously. Will definitely get this book! Hi Isabelle, that's great to hear - I always seek out historicals set in India. Best wishes for success with your own writing. I just found your blog and added it to my sidebar. Your blog is excellent - lots of writing-related inspiration - and I'm looking forward to hearing your thoughts on the books on your TBR!